Grant Wahl shares outtakes from his SI magazine story on Leicester City, the 5,000-to-1 longshot closing in on the most improbable of Premier League titles. LEICESTER, England — How great is the Leicester City underdog story? Well, let’s just say that a four-day visit to the East Midlands—aka, the center of the soccer universe, circa 2016—can produce multiple stories that restore your faith in the inspirational power of sports. This much is fact: If Leicester City can hold onto its Premier League lead—currently at five points with seven games to go—it will be the greatest season-long surprise champion in the history of professional team sports. Remember, Leicester was a 5,000-to-1 shot to win the Premier League before the season, roughly the same odds of a No. 15 seed winning the NCAA basketball tournament (which, obviously, has never happened). And so fantastic stories are everywhere in Leicester these days. I wrote one on the LCFC phenomenon for Sports Illustrated magazine and another on an American couple—named the Foxes, aptly enough—who turned a trip to see their favorite team into a celebration of their engagement. And now, because there was so much good material on this trip, I want to introduce you to the people I spoke to in Leicester, the people who are living this true-life fairytale every day. They even introduce themselves like characters in a play. We’re sitting in The Birch’s office just inside the front door at Leicester’s humble training ground. With barely any square inches to spare, his walls are covered with Leicester team photos from over the years. The Birch had a hip operation not long ago, and so he watches Leicester games sitting on a chair at the exit of the players tunnel at King Power Stadium. To hear The Birch describe it, Leicester used to be like one of those towns on the New Jersey Turnpike—just another exit number—except in England it’s the M1 running past. "We were that place off Junction 21 on the M1 coming up from London," he says. "Nobody noticed us. People just whizzed by on the M1. But nobody whizzes past now. Every car that goes up and down that M1 will see the sign for Leicester and say: 'They’re doing well, aren’t they?'" There’s a new character everywhere you go in Leicester these days. Here’s Claudio Ranieri, 64, the Foxes’ first-year Italian manager, who combines the attributes of a kindly grandfather who’ll buy you a gelato with the iron will of someone whose playing career exceeded his skillset. 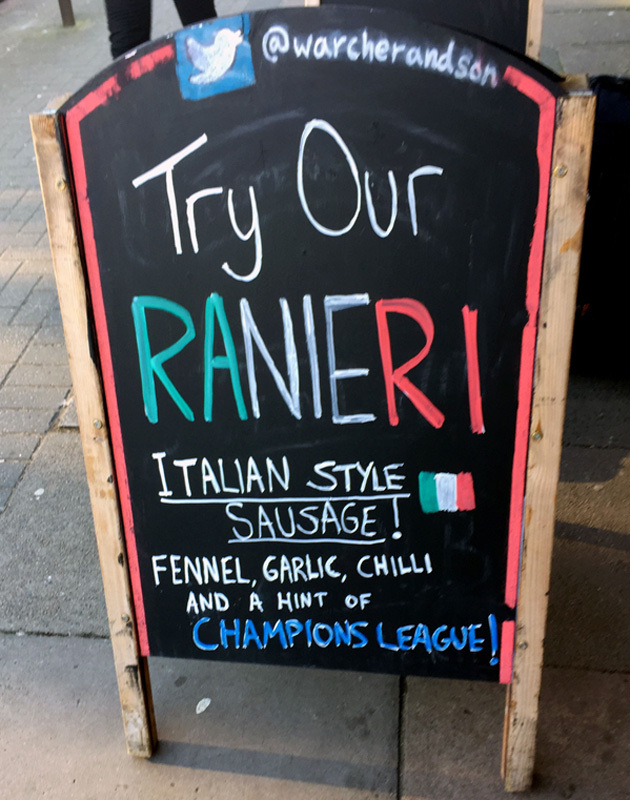 Ranieri literally promised his Leicester players a pizza party if they kept their first clean sheet of the season, and in October he gave them one. Here’s Arlo White, the NBC Premier League broadcaster, who’s a Leicester native. White never suspected he would be calling pivotal Premier League title-race games involving the team from his hometown. But here we are. White knows his history and context, knows that nearby rival Nottingham used to have a leg up on Leicester in terms of underdog soccer stories—Nottingham Forest under Brian Clough earned promotion to the top flight in 1976-77, won the title the following season and raised the European Cup the next two seasons—and in terms of historical events. But the 2012 discovery of King Richard III’s remains under a Leicester parking lot changed things, as has Leicester City’s magical run this season. And here’s Leicester’s deputy mayor, Rory Palmer, who’s still processing all the global interest in his city. And if Leicester were to win the Premier League? Are city leaders ready for that party? Here is Kasper Schmeichel, Leicester City’s goalkeeper. The Foxes have some remarkable stories: Vardy, who’s had a storybook rise from semipro soccer at age 25 to Premier League Golden Boot chaser at 29; captain Wes Morgan, the Nottingham native and tattoo shop owner who toppled the U.S. while playing for Jamaica at last year’s Gold Cup; and Riyad Mahrez and N’Golo Kanté, two whip-smart signings who were playing in the French lower divisions not long ago. SI: In pure football terms, how have you guys been so successful this season? Schmeichel: I think it’s got a lot to do with our mentality, our belief. We play to our strengths. We don’t try to be something that we’re not. We know we’re not technically the most gifted team in the world, but we can play very, very well if w have to. We can also grind results out, and that’s the way you build very good seasons. SI: If you were being honest at the beginning of the season and I said you’d be top of the league in the stretch run, what would your response have been? ​Schmeichel: I mean, to be honest I wouldn’t have thought we’d be top. With the team we had, top eight was realistic, top six would be really, really good. So obviously this is good at the moment. For us, nothing is won yet. The season is still a long way before it’s finished, so we aren’t getting ahead of ourselves. SI: You’ve been on a lot of teams. What’s special inside this team that you almost never see? 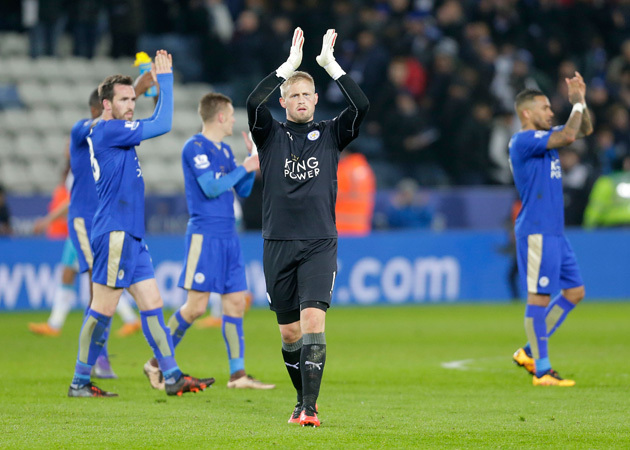 Schmeichel: There’s so much respect between all the players in the dressing room, which creates a good spirit. It means you can have a lot of laughs and jokes at and with each other, because you know the respect is there. We’re a group of players that in football terms has been together for a long time, three or four years for some of us. We’re a group that’s experienced some great highs and some quite horrible lows. So it’s brought the team very much together, and there’s a core of players that know the values of the team, the values of the club. And the new players coming in have all been fantastic and bought into that and understood that straight away, which has been phenomenal. A lot of it goes down to the scouting department. I don’t think they just scout for players’ ability, they scout for their mentality as well. SI: Claudio Ranieri has coached at some pretty big clubs, and yet his previous job before coming here with Greece didn’t go well. What was your reaction when he was hired last summer? Schmeichel: It’s a long time since he’d been in England, so we didn’t know too much about his methods and what he was going to do. And to his credit, the first week he didn’t really say a lot. He just looked at how we did things. He’s basically just kept that going. He could see we had a special group and had momentum. That’s where I think he deserves the most credit: He didn’t want to go in and tamper with that, because it might have been detrimental to the team. It’s a manager’s prerogative. Most managers do go in and want to change and do things their way. But why change something that was working? That’s the difficult thing for a manager to do, is to maybe compromise a little bit with his own beliefs or values and go with sort of what was there, which was very much to his credit. SI: Whether it’s Ranieri or a lot of the players on this Leicester team, a lot of you have been told at some point that you’re not good enough. ​Schmeichel: Yeah. A lot of players here, including myself, have been to other clubs and had success and had some not-so-successful periods as well. Those are the times that sculpt you and shape you as a man, as a player. The easy times are when you’re winning. Everything’s fine, nothing can go wrong. But when things go wrong, that’s when you sort of learn about yourself and your teammates. This team has been through highs and lows, and you learn a lot about each other. People having that type of rejection at other places stokes the fire inside you, and you have a personal desire to do well, that nothing’s going to hold you back. And you keep going with the mentality that you’re going to succeed no matter what. A lot of the players here have that mentality. SI: Have you allowed yourself to imagine the possibility of winning this Premier League title? Schmeichel: I mean, as a kid you dream of winning the Premier League and the FA Cup and the Champions League. All those things. And growing up you still have that dream. You become more realistic on things, maybe, but no matter what I think it’s important to dream. From the day I decided to become a professional footballer, my dream was to win the Premier League. Otherwise, why would you play? You’re in a position now where you’re top of the league, and we have to keep going. But for the title? Who knows? We don’t want to get ahead of ourselves. Right now it’s the next game that’s the important one. Schmeichel: Everywhere you go now—to a restaurant, to a petrol station—everyone is just saying, “I hope you win it.” The football romantics would like us to win it because it’s a great story, and 5,000-to-1 is quite a longshot. But it just goes to show that you can capture the imagination of a person by playing a certain way and with passion and spirit and heart. Every player on this team epitomizes that, and that’s why they’ve endeared themselves to the footballing world. There’s a story everywhere you turn in Leicester these days, from Schmeichel and The Birch to Arlo and Ranieri to Vardy and Richard III and the engaged American Foxes. In sports, it doesn’t get much better than this. Seven games to go.